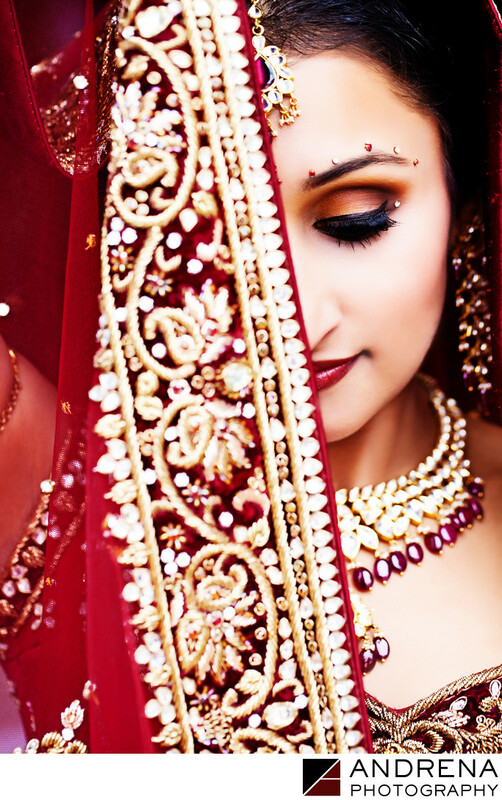 An Indian bride's dupatta can be such a beautiful part of her wedding outfit. Not every bride has a dupatta. Brides who wear saris generally don't wear dupattas, and instead leave their heads bare or wear flowers. But for Indian brides wearing lenghas, the dupatta provides a beautiful complement to an already beautiful outfit. I have long enjoyed using the border of a dupatta for portraits. If the dupatta is pinned to an Indian bride's shoulders, there may not be much flexibility in position. But when the dupatta is arranged in a different way, it can provide a wonderful range of options for bride portraits. This bride portrait was taken at the Bel Air Bay Club in Malibu. The wedding ceremony took place on a cliff overlooking the ocean, and the reception too place at Pacific Palms Resort. I love the serenity in this portrait. It's hard to coax just the right expressions out of a subject, but the extra effort is what makes a photograph come alive. Indian wedding photographed at the Bel Air Bay Club in Malibu, California, and Pacific Palms Resort in Industry Hills, California.